1. 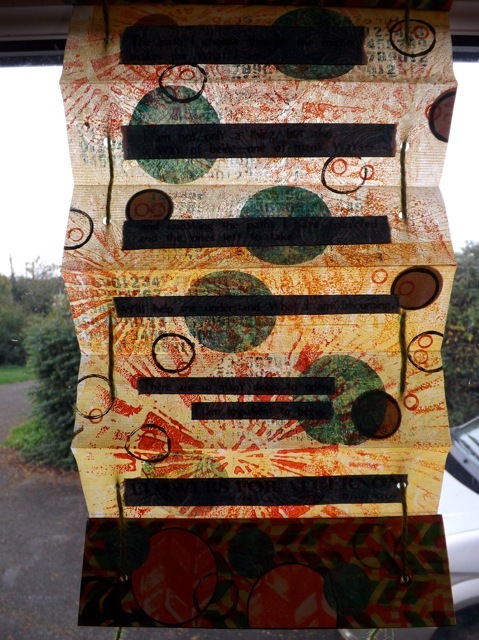 The vellum background – Wallpaper motif. See the post on anaglypta wallpaper samples. 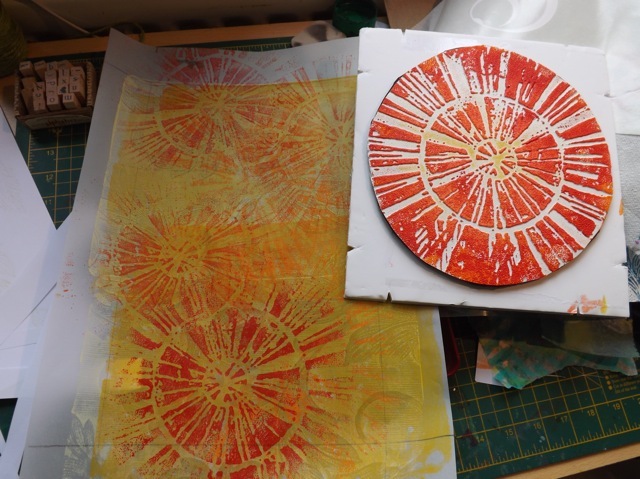 I used the wallpaper motif in three ways – first, I used it to remove a bit of the paint from the plate to pull a ghost, then I loaded the plate with a darker yellow and brayered on an orange to the motif. 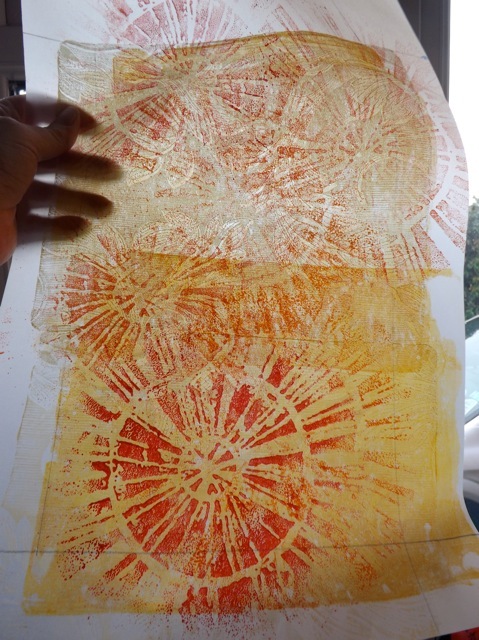 I stamped the motif ONTO the yellow on the plate then pulled that over the lighter yellow, then I brayered red paint onto the motif and added it as a stamp over the print. 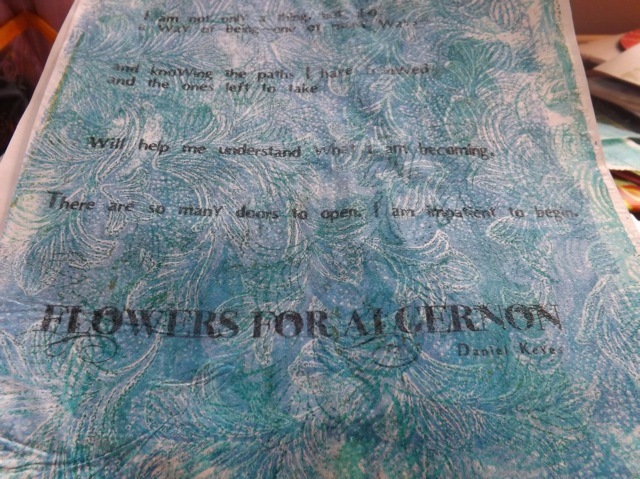 I first ironed the Deli paper to some freezer paper, but in the end I could have just stuck it well to cardstock, and run THAT thru the printer, as the sheer Deli paper let too much of the stuff behind it thru for the text to actually be readable. 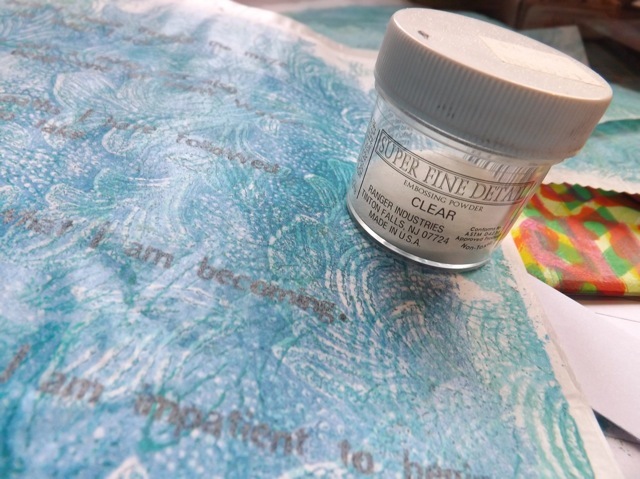 As soon as it came out of the printer I coated the wet ink with Superfine clear embossing powder and heat embossed it. 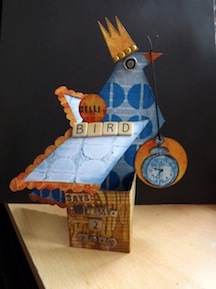 Black might have been better but I worried stray specks would ruin it. 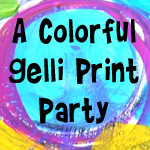 Now I know as long as the Gelli print is DRY as a BONE, the embossing powder will not stick to it, and the black embossing powder would really stand out more. 3. 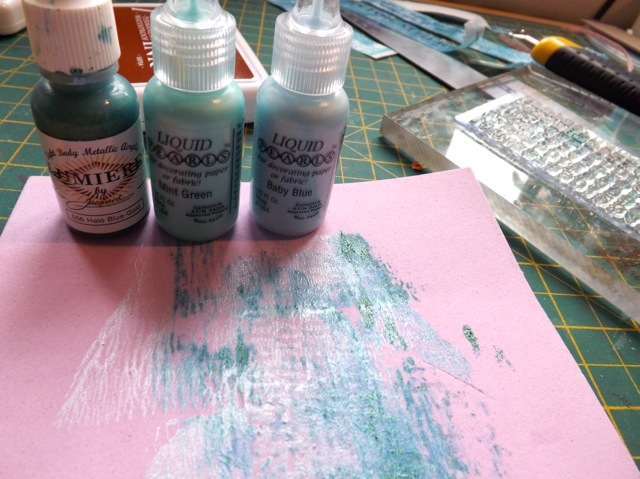 Pearl stamping – Lumiere paint and Liquid Pearls mixed. 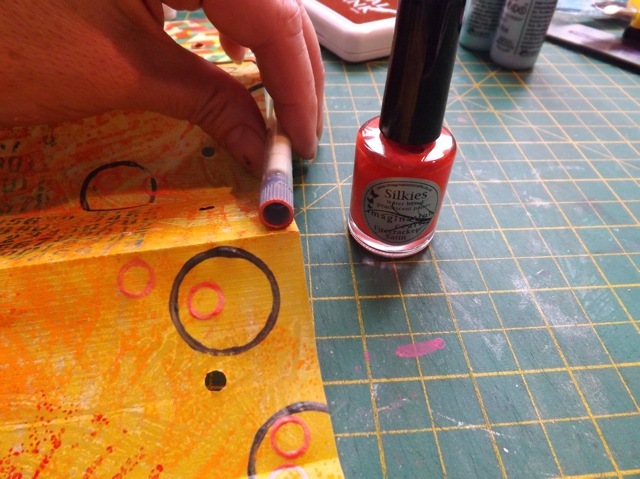 I squeezed out a couple colours of Liquid Pearls and a bit of Lumiere paint then mixed them by brayer (I wanted it patchy, not one smooth colour!) 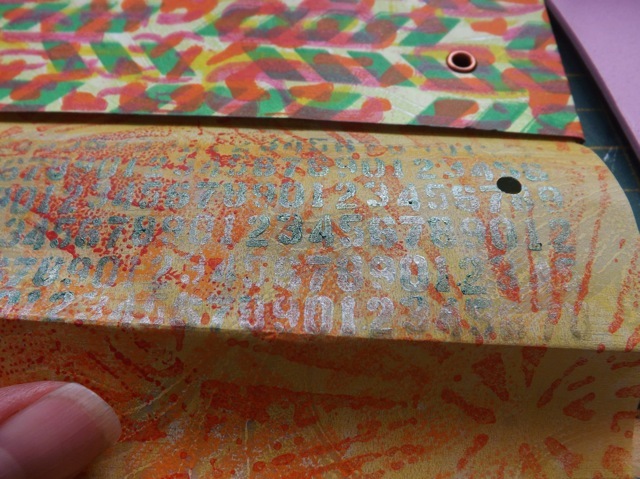 and tried both brayering that onto the stamp then stamping and pressing the stamp to the mixed paint – both worked although the brayered paint was lighter. I love the tiny circles but finding bottle caps that small is hard. I used a little eraser holder, but I also find removing the eraser from a mechanical pencil and using that also gives a really cute small stamp. 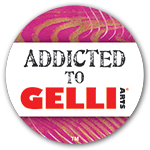 Categories: art, Gelli plate monoprints | Tags: art techniques, Gelli, Gelli plate | Permalink. 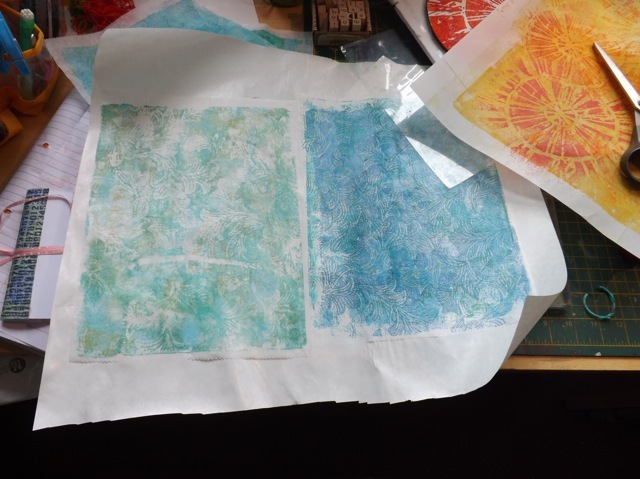 Wow what an interesting tutorial – THANK YOU I’m going to go back to your post on anaglypta wallpaper samples now to catch up on on more of your tips and techniques more great tips.